This evening my son brought over some old photo albums of mine. Included is a photo of Dr. Fredrick Fennell playing on my drum. Dr. Fennell was guest conducting a U.S. Coast Guard Band Concert in New London. I believe it was the fall of 1980. A very good friend of mine hosted a party for Dr. Fennell at his house. Knowing of Dr. Fennell's Fife & Drum Recording with the Eastman Wind Ensemble on the Mercury Label I decided to bring my drum to the event. He graciously played a few notes on the instrument. I thought you would appreciate the photo. Ed. Note: For more about the drum, please see "The Story Behind the Last Soistman Drum Ever Built", this blog, June 23, 2009, and the comments to that post. 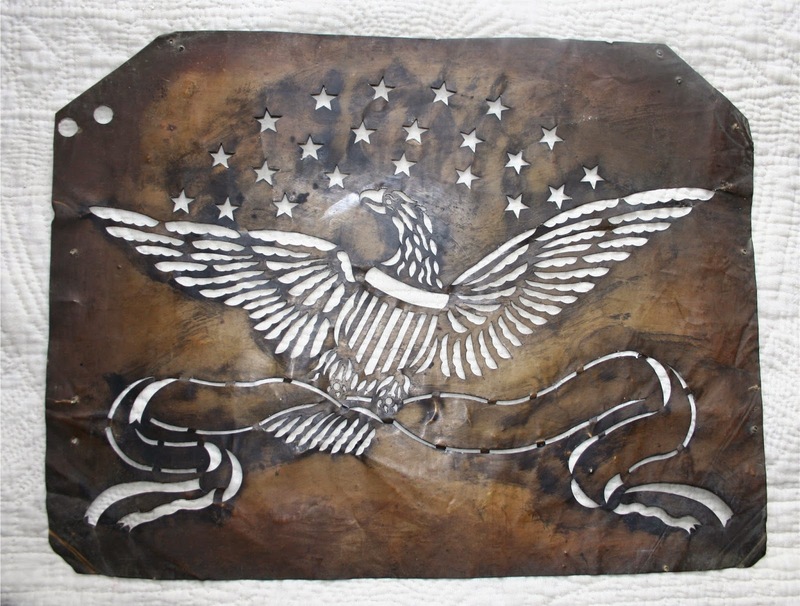 Several years ago, I acquired a 19th century sheet brass stencil of a fairly detailed eagle that I suspect may have been used as a template for military drums. The eagle measures approximately 13" H x 17" W. The eagle has outstretched wings between which is a three band arch of 22 stars. Unlike every drum eagle photo I could find, this one clutches the ribbon in its talons rather than its beak but the ribbon is wide and clearly designed to take added lettering. I was wondering if you wouldn't mind looking at a photo of it to give me your sense of what it is. Ed. Note: I could not find anything with a quick Google search. Readers with information to share are asked to do so by email to BlogMaster@FieldDrums.com. Depicted with a river and hills in the distance, sky at sunset. Oil on canvas, 44-1/2 x 31-1/4. The stretcher and remnants of an old printed label reading in part "... rear entra(nce) NEW YORK / ... YORK /ANTIQUES EXPOSITION ... ." The label is said to have referred to Albany at one time, indicating an exhibition in that city, possibly celebrating the centennial of 1876. Chandler was born in South Hadley, Massachusetts, where his family owned a small farm. After a brief apprenticeship with a cabinetmaker, he studied painting in Albany, New York, between the years 1827-1832. 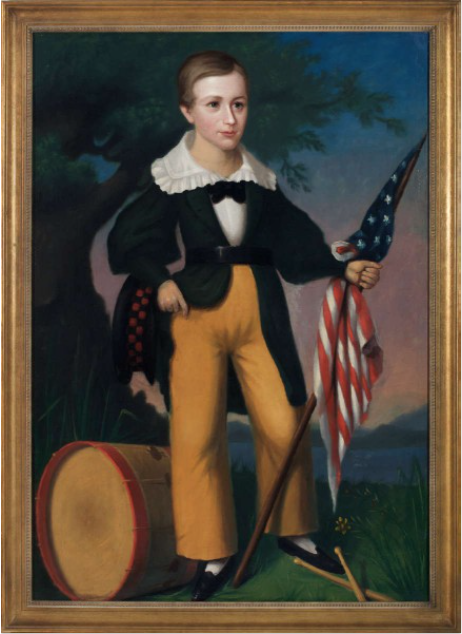 Most of his known paintings date from 1837-1852, a period when he traveled parts of the Connecticut River Valley, particularly northwestern Massachusetts, working as an itinerant painter. Provenance: Alice Braunfeld, Los Angeles, early 1980s. Literature: For additional information on the artist, see John W. Keefe, "Joseph Goodhue Chandler, Itinerant Painter of the Connecticut River Valley," The Magazine Antiques, November 1972, pp. 849-854. Note the resemblance of Chandler's maternal grandparents, figs. 2 & 3, to the drummer boy.